Back in April, I posted a session from BriForum Amsterdam comparing Xen to VMware ESX. The only problem was that enough had changed in the time between BriForum and the release of the video that some people found it wasn't relevant. So, in an effort to keep up with the times, today we're releasing the updated Xen vs. VMware video from BriForum 2008 in Chicago. 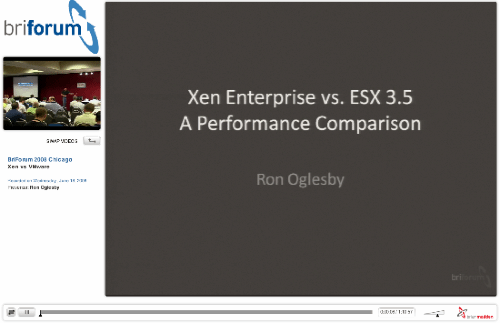 In this session, Ron will share his results of running Xen and VMware ESX head-to-head on the same hardware. In addition to normal server testing, Ron also tested Citrix Presentation Servers as guests in each environment. Please take a moment to convert the pptx file to Office 2003 and offer that as well?? An additional option is to put the slides on SlideShare or a similar website. Very interesting. Keep up the good work, Ron! only problem is that the compatibility kit is not available for Mac Office, and Google Docs Spreadsheets doesn't support the upload of a pptx. Can someone please provide a link for the downgraded ppt format. MS released an open XML (i.e. Office 2007) converter for Mac last year. That's a standalone app you can download from http://www.microsoft.com/mac/downloads.mspx. And of course if you're using Office 2008 on the Mac, it can read the files natively. We're going to update our player so that it supports "progressive" downloads, which will let you pause the video while it fills the buffers as far as you want. This is cool, except with progressive then you can't "jump" ahead in the video past the part that's actually been downloaded / cached. But I think we'll get this in the next few days. How about a wide screen format that will support Scott's arms? Â Imagine finding Scott in bed with your missus... you'd would tuck him in for the night and make him a cup of hot chocolate wouldn't you? Seriously, great video, excellent content as usual, thanks. Well, with the exception that his name is not Scott. It's Ron. Let us know when you get thisâwatching this is amazingly painful/useless. Anyway we are talking Scott Herold right? so our new book, or has Scott written one that he didnt let me in on? As opposed to downloading the pptx file putting on a corporate LAN, or on a computer that Ron will never touch nor gave permission to do so? I'm confused, how it uploading a document to my own personal workspace in the cloud which is privacy controlled by myself any different then downloading the file? I am surprised you of all people would make a comment like this. Perhaps your not the same Brian which presented "The Future of Client Computing" at Briforum 2008. I'm sorry if I live in a world whee a computer needs nothing more then a browser and a few plugins. A world where I refuse to buy a $400 software office suite that I might use once a month on a home computer. Have you not used Google Docs before? It is truely the future of client computing! Hehe, just trying to protect the innocent. I was going to put my full name, Gabriel Medrano, but then remembered I am a nobody, LOL. I am just thankful for you somebodys. Looking forward to more information as I am a little nervous about moving our 400 concurrent user farm to ESX 3.5. I wish I had my own lab, and leg press for that matter, but thought it would have been interesting to see a 32/64 bit comparison on both platforms. There's a doc out there where Citrix hired a company to do some performance testing with XenApp on XenServer and 64 bit performed 87% (or something like that) better than 32 bit. Interesting at the least. Hey all, we did locate a potential problem with the video. We'll get it re-encoded and put up online ASAP. I watched the first comparison, where I recall Ron stating that Xen/VMware compared well memory-wise, but not so well I/O-wise. It is good that Xen has caught up!! This makes it more attractive to SMBs. VMware vs. Hyper-V -- may not be easy, since they are different kinds of hypervisors, whereas VMware and Xen are more similar than are VMware and Hyper-V.
And possibly XenServer to Hyper-V and xVM as well. I know these tests are time-consuming and require a lot of expensive lab equipment, etc. but they would be a great public service if they are performed by people who don't work for any of the companies. I think you are referring to the Tolly Group report that Citrix commissioned. It provides some good data on the performance delta between running XenApp 64-bit on the metal and XenApp 64-bit on XenServer. But the testing methodology used for 32-bit was arguably flawed. IIRC it tested 16 GM memory 64bit physical server against a 14 GB Memory 64-bit guest and a 4 GB 32-bit guest. No prizes for guessing that the 4 GB 32-bit guest ran out of steam long before the 14 GM 64-bit guest. Come on, what a complete waste of time comparing the two or even considering buying or using Xen over vmware unless you are mentally challenged. Why? Xen is a great hypervisor and will only get better. VMware has great tools but they (and a lot of their customers) are arrogant and cocky and this will only quicken their demise. Yeah at amazon. It seems they sold out the entire first batch faster than they expected. Should be in stock shortly. Over the weekend we fixed the video and re-uploaded it. It should work fine for everybody now. If you delete something it goes to trash bin. Unfortunately like the Mac OS X trash bin, you can't remove just one item from the Trash you have to empty them all. Now if you do this are they truely gone? well they're gone from yours and others view, but I am sure that if Goole can find what you searched for and the results inwhich you clicked on over the last two years, surely the can bring back to life a document that you deleted if someone pushes them to do so (federal gov't, police, courts, etc.). Do you work for VMware by chance? BTW, I'm surprised VMware hasn't gone into attack mode on this with its full legal force like they did a few months ago against other industry analysts. If he did his testing in Europe or worked with the bri-forum presenters from europe the licensing over there is different. You can do and present perfromance test based on that licensing EULA. Thank you. Much better performing video. Ron was entertaining as always. More information will follow as soon as possible! I liked this presentation. But I think the management component/analysis whilst current will change substantially when Microsoft bring out their management tools for Xen and Hyper-V (MS SCOM). But what I really wanted to know is the comparison in feature sets and limitations of both and a comparison of them. Just a thought. Other than that, it was very enjoyable.